What is the best under seat subwoofer? 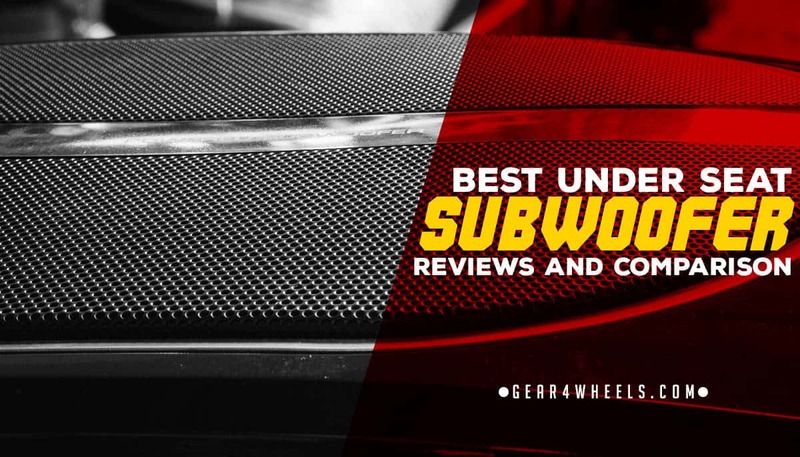 Well, we've tested around 30 units from the best car audio brands and also a few from not-so-well-reputated ones and have finally crafted the list of the top 5 underseat subs that you can buy right now. If you are looking for powerful bass, yet something that won't use a lot of space, consider then some of these shallow mount subwoofers instead. If you want some balance between powerful bass and space economy, then check our recommended shallow mount subwoofers. All in one system. Just plug and play. 75w RMS is easy to power. Kicker is a manufacturer known for offering their customers a lot of bang for their buck. It may sound cliched, but is the truth as far as their underseat subwoofers are concerned. The 11HS8 is slightly larger at 3” high, but it still fits in cargo areas and under seats where you normally would not find a subwoofer. Add to that the 150-watt RMS power with an 8” sub, and this little sucker can shake some seats. It uses a standard 3.5 mm stereo line in cable that connects to most standard vehicle stereos. One nice feature you don’t see on a lot of underseat sub kits like this is the metal mounting bracket for the wired bass level remote. My wired remote on my subwoofer kit occasionally strays out of reach while driving, so having a fixed point to clip it to in the cabin is major selling point for me. All in all, this Kicker Hideaway is a great sub that provides a nice balance between its small footprint and serious power. In terms of drawbacks, Kicker had some issues with the quality of build on the original Hideaways, but claims they have corrected those issues in process and users are no longer experiencing loose cones or cones broken loose from their coils after extended use. That’s about the worst thing I can say about this kit, as it is an excellent solution for bass heads that are looking to add that something extra to the low end of their sound system and have a little room to spare under the seat. In comparison with not-so-powerful factory speakers, the bass levels may be too high. Great if you have upgraded speakers too though. This little subwoofer unit might look small, but the sound it produces is not small at all. The 5”x8” woofer peaks at 150 watts, giving it almost as much punch as a much larger trunk mounted subwoofer system. An impressive bass machine, this combination amplifier and subwoofer fits neatly under the driver or passenger seat of even compact cars or SUVs. Included mounting brackets can be attached to the sides or ends of this unit to give you some wiggle room in terms of how it is mounted in your vehicle, and they add a mere 1-⅛” to the width or length, and an extra 1-1/8th” to the height. Signal input is fed from the line out of your car stereo (usually a double RCA connector pair on the back of the head unit) through the included 14’ speaker-level input extension cable. The wiring harness necessary to connect your unit to your vehicle power is also enclosed, as is a wired remote control to adjust the volume and power level, crossover point, and phase from 0-180 degrees. 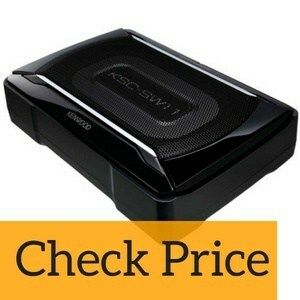 Installing and connecting this subwoofer can be something of a chore if you aren’t particularly car audio or electronics savvy. The features, power, and size of this unit make it a very attractive option for those who want a subwoofer in their car but aren’t interested in blowing the doors off other cars at stoplights. I’d recommend this model to someone who wants some extra “oomph” in their car stereo that doesn’t create a massive battery drain, overwhelm the passengers and driver, or take up too much cargo space or room under the front seats. Not compatible with all factory car stereos, may require a headunit with stereo line out to be installed in addition to the self-contained subwoofer kit. Probably one of the most powerful underseat subwoofer offerings on the market right now, the Sound Storm LOPRO is an absolute beast in terms of low-frequency output and bass performance. Sound Storm rarely makes it into our lists since we don't think they match what others offer. However, for this little under seat subs we do think they've made a great job of producing a good quality, affordable product. The LOPRO line comes in two options: a 600-watt 8” subwoofer model, and a 1200-watt 10” subwoofer model. Aside from raw power, the differences in features are negligible. Both include a wired remote with integrated mounting bracket, and the line out cable from the stereo head unit. Unlike most underseat subwoofer kits though, neither model includes the necessary wiring or cables to run power from the vehicle electrical system to the subwoofer kit. However, if you feel you are competent enough to purchase your own subwoofer installation kit and mount either for these units, then they are definitely the best option for anyone who wants power comparable to a trunk mounted or cargo area mounted subwoofer box and amplifier setup. The lack of installation kit is a bit of drawback, but both kits come throw a serious amount of thunder and are backed by a 3 year warranty, so it evens out in my opinion. Saves space while delivering the same performance as much larger subwoofer kits. Targeted towards single cab pickup owners, the R2S-1X10 Prime subwoofer enclosure is Rockford Fosgate’s solution to poor bass performance in your pickup truck. Drawbacks to this model include a lack of any included wiring (such as the heavy duty speaker cable you will need to run between the source and the enclosure), the need for an amplification source, and some mounting hardware to keep it in place while your vehicle is in motion. This underseat subwoofer kit requires a very strong working knowledge car audio installation and mounting equipment and hardware to your vehicle. If you aren’t much of a DIY kind of person, this might not be the best choice for you. The audio quality and low-end performance of this enclosure are downright impressive for its size and power, but overall it is going to be the most problematic to install. If you want the best sound and don’t mind figuring out the wiring harness and power supply for a sold-separately amplifier, then by all means get this underseat subwoofer. Otherwise, you may want to look into something else. Pioneer currently leads the market for head units and it is obvious for all that they make some amazing audio hardware, and this enclosure designed for pickups and similar vehicles with cabin space for mounting is no exception. At 300w RMS, it has more than enough “oomph” to kick out the jams with exceptional low-end frequency output and performance. The enclosure is bulkier than many similar models, but the unpowered design with no integrated amplifier means that it can crank out higher performance in a smaller package. It does have the disadvantage of not including much in the way of wiring (heavy gauge speaker wire not included), but it does come with all necessary mounting hardware. This is the kind of simple, easy to power sub that I love. Just hook it up to a 5ch amplifier together with your speakers and you're good to go. This option definitely saves on needing to run a separate power line to the subwoofer enclosure, and it effectively doubles performance. Honestly, among the unpowered sub enclosures on the market today designed to work with existing car stereo hardware, this one is definitely topping the list in spite of its minor drawbacks. Many consumers typically associate the concept of subwoofers with massive, boxy, plexi-glass encased dual horn systems that crank out significant, bone-shaking, skull-crushing decibels of auditory devastation. However, many car audiophiles simply want some low-end frequency boost to balance out the high-frequency clarity of the highs provided by the other speakers in their car audio system. This is specially true if you upgraded your speakers, which will provide with loud and clear mids and highs. For those users, there are a variety of options in underseat subwoofers. These compact units are typically a combination of a mini-amplifier and and a subwoofer speaker that generates low-frequency sound for increased bass response in music. Underseat units lack the raw wattage and speaker volume necessary to compete with trunk mounted subs, and it is not realistic to expect them to go toe-to-toe with a full set of 12” twin subs with a hi-power amplifier and crossover, but they definitely get the job done for most people who aren’t looking to compete in car audio competitions, or who just want to preserve the cargo space or comfortable seating options in their car or SUV. Choosing the right underseat subwoofer can be something of a challenge, as there are numerous options in all shapes and sizes, as well as power ratings and audio response levels. Ideally, you should select a subwoofer that can be easily fitted under the front passenger or driver seat of your vehicle, and that is compatible with the factory or aftermarket stereo amplifier that you currently have installed. If this task sounds intimidating, don’t get anxious: check out these five underseat subwoofers that stand out from the crowd without breaking your budget or your car stereo. At the end of the day, choosing the right underseat subwoofer requires you to consider three factors: amount of space you have to work with, your technical know how for installation, and what kind of existing audio setup you have in your car. Overall, I’d have to pick the Kicker “Hideaway” 11HS8. It offers the best overall performance with the most included hardware, and it also has one of the smallest footprints in its class. From our tests, this really is the best under seat subwoofer 2016. That you so much for your review and point blank personal opinion on the unit you prefer. . Every other “top picks” sites I’ve seem seemed to dance around the issues and not decide on which one was best.